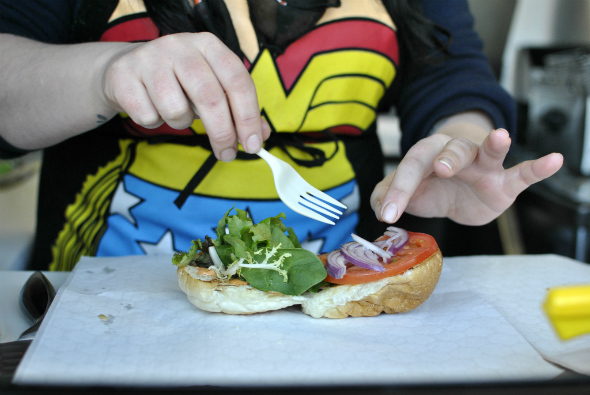 Wiggle Room is a new east-coast style burger joint running out of Market 707 . The Aptly named space measures in at only 8' by 10' and is now occupied by Ashley Shortall and Daniel Tremblay. The two now spend their days jostling in their cramped quarters preparing old favorites based on their east-coast roots. 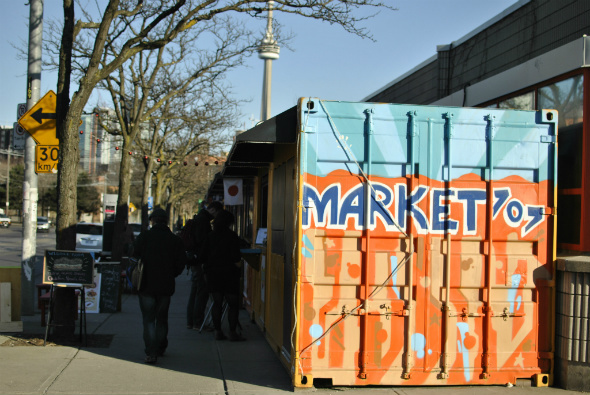 Wiggle Room is the newest occupant in the line of converted shipping containers against the north wall of the Scadding Court Community Centre just east of Bathurst on Dundas. Along this strip you can get your bike tuned up, grab a cup of coffee, or chow down on some Indian, Asian, and Latin eats. 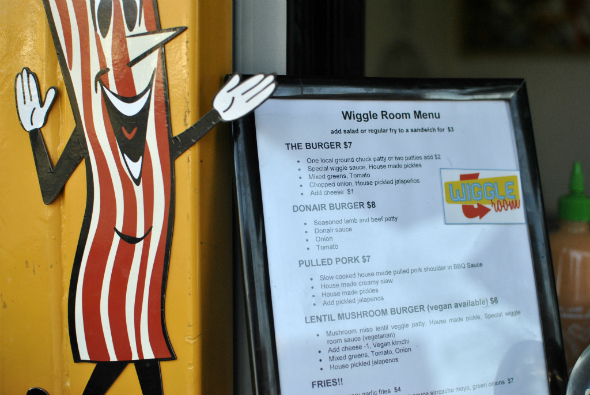 Wiggle Room is the first to bring a Canadian inspired menu to the Market. The small menu is made up of sandwiches, burgers and fries predominantly made from locally sourced ingredients often bought daily at nearby Kensington Market. On a Friday afternoon we poked our heads into their stall to check out this new spot. We were easily convinced to try out the Newfie Poutine ($6), which we learned is a staple in every chip truck in Newfoundland. 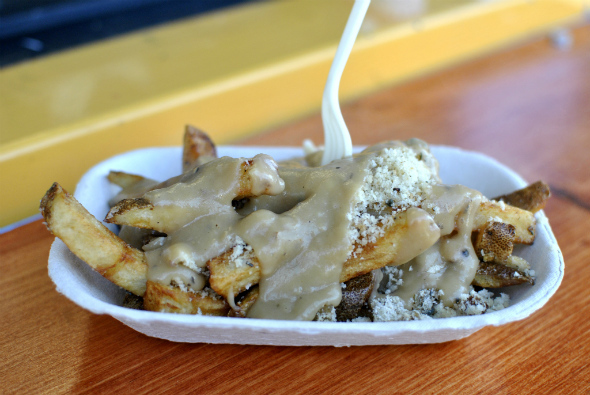 The thick, hand-cut fries are topped with a light stuffing (dressing) and rich beef-gravy. We're told that in Newfoundland a traditional Friday night dinner often leaves the hosts with a huge amount of leftovers. In true east-coast ingenuity, this inspired a new take on poutine. The Newfoundland version is heavier than its Quebec counterpart, adding stuffing to the combination of fries and gravy. 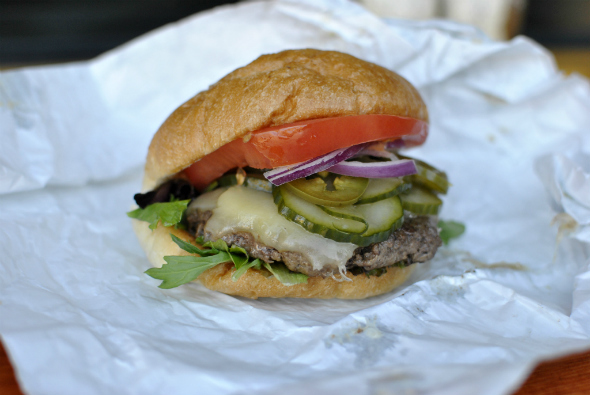 The Donair burger ($8, lead photo) is a lamb and beef patty seasoned in the same style as the east coast favourite. Tasting as if it was just cut off the rotating spit, this sandwich is served with the traditional sweet-garlic Donair sauce, fresh chopped onions, and tomatoes on a fresh Cobbs Bakery bun. The classic burger ($7) is a ground chuck burger made with all Ontario beef from Sanagans. While a touch overcooked, the patty was still quite juicy and flavourful. It comes dressed with "top-secret" wiggle sauce, homemade pickles, jalapenos, tomato, lettuce and onion. In a race against the still cold April air, we quickly scarfed down the meal while steam was still rising off the fries. Given the great food and a fun attitude, we're sure to stop in again once the weather starts to improve to see how the menu evolves and what seasonal beverages emerge from the Wiggle Room. In an effort to make the dining experience slightly more comfortable the 707 Market Community is currently looking for crowd-source funding to help pay for an outdoor patio. 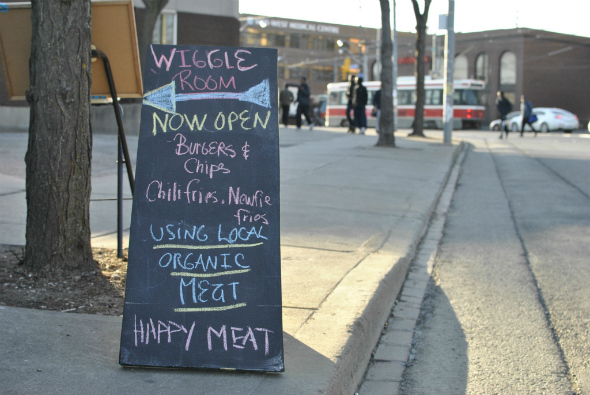 Wiggle Room is a welcome addition to this strip which is sure to come alive throughout the summer.